Located in the heart of Ocean Grove, DareVue is only a block from the shopping strip and 2 blocks from the sandy Ocean Grove beaches. With over 70 squares in total featuring 6 bedrooms sleeping 18 people, 2 kitchens, 3 bathrooms, capacity for 6 onsite cars, 3 of which can be garaged. DareVue is a modern design with huge living areas and large rooms. With panoramic views from the entrance to Port Phillip Bay known as ‘the rip’, Point Lonsdale lighthouse and Bass Strait all the way to Cape Schanck. The large upstairs decking area is complete with BBQ, tables & chairs so you can cook up a storm and enjoy an outdoor dining experience with panoramic views. The dedicated theatre room features a huge 108” screen, surround sound & recliners. In the large living areas there are 2 flat screen TV’s and a supply of board games to enjoy. DareVue is ideal for groups, multiple families, corporate / team building events, reunions, parties etc. 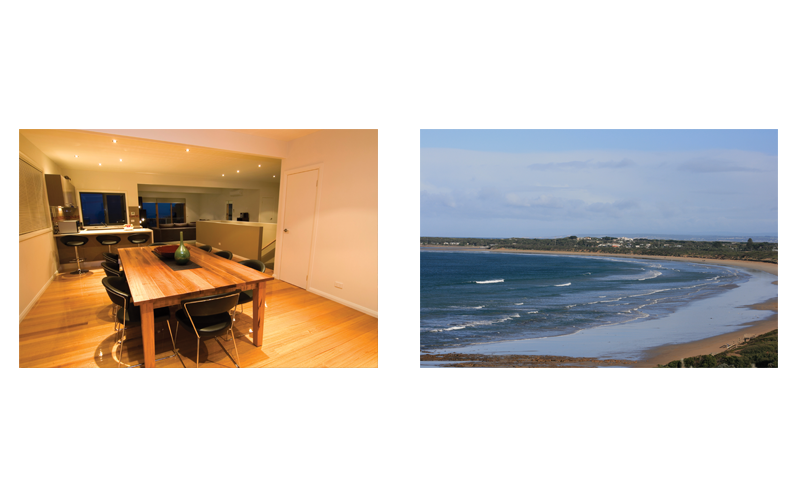 There are plenty of wineries, top class golf courses, bay, river & ocean fishing, touring the great ocean road, fun parks, surfing, restaurants & cafes all within close proximity. All linen & bedding is supplied. Action packed or slow & relaxed, the choice is yours.